This year for the Pismo kiteboarding expo we had a great showing of hundreds of participants taking advantage of the spring winds and gear demos! We had all the Slingshot and Ride Engine gear out on the beach for demo. The kites were a big hit with the showing of the new turbine kite, Wave sst, rally and RPM. The Surfboards were popular with the Celeritas being a crowd favorite. We Raffled off a Slingshot vision Twintip to raise money for the local junior lifeguards. Check out this stoked new owner! We were really lucky to have such great conditions of wind and waves and we had a lot of fun riding during the expression session out front. During the winter we get consistent swell from the northern hemisphere but getting thewind to line up is much more fickle because of the storm systems that spin down the coast effect the flow. My Dad and i saw that the wind was going to be on so we loaded up the car with all the boards and kites and i called my friend Tony Modguno, the filmer, to see if he was in town. Tony, just getting done shooting the wedding season was pumped to escape to the beach and have a few beers while getting sandblasted with the camera and hopped in his truck to meet us there. The winter rains brought some beautiful green tones to the hill sides and made the air crisp and fresh. We crested the ridge to find some nice lines rolling in and it looked like the wind was about to build. Time for some fresh wax on my Slingshot Celeritas 5'6" and to pop in my FCS2 Fins, so good to not need any tools just in they go and they are solid. Not sure what the wind was going to do so i pumped up my 8m and 6m Wave SST from Slingshot Kiteboarding so i was ready for any conditions. By the time i got my gear rigged and Tony all set up on the camera the wind was up and the session was on. I put on my All Good Sunscreen and turned on the tunes to my Waterfi ipod and strapped up my Ride Engine Harness stoked for a good day on the water. I hit the water first getting a nice solo session as the wind filled in. Then as the wind cranked up i was joined by my friends James Ropner, Ian Alldredge and Zac Baxter. We kited all afternoon trading waves, sharing waves, doing flips over each other, it is really is fun to ride with all the homies. Taking a short break for food, water and a beer i went back out for the sunset session which was super windy but i stayed on the 8m because it was working well and sometimes it feels good to be super overpowered. As the sun dipped behind the horizon i got a handful more waves, which felt nice no longer getting blinded by the sun, should have been wearing my Kurtis surf Shades, to save my eyes. Calling it a day my Dad gave me a land and i rolled up my lines and deflated my kite. Still in our suits James handed us all a beer and we sipped on our cold brews as we watched the light fade on an awesome Beach Day. session we decided to pull out the strobe and do it night kite it's pretty difficult to pull off but the results are really unique. This is the first time I've ever shot with strobes in the ocean and it was really fun. Hope you enjoy and go check out the magazine! We have been working on our harnesses for three years now and we are stoked to release three new lines of Harnesses, The Core, The Team, and the Elite. I have my model the Patrick Rebstock Signature in the Team Series a perfect balance of light weight performance and comfort, utilizing high tech composites materials like carbon fiber and kevlar. These harnesses will change how you ride and allow you the freedom of movement to do things before never thought possible. In addition to our new harnesses we are launching our new Wetsuit line up that have been developed by us to keep you warm and comfortable in any water conditions from tropics to Canada's freezing coastline. With a lifetime of surfing and kiting we understand the needs of a good wetsuit and we are really stoked on our first offering of suits. 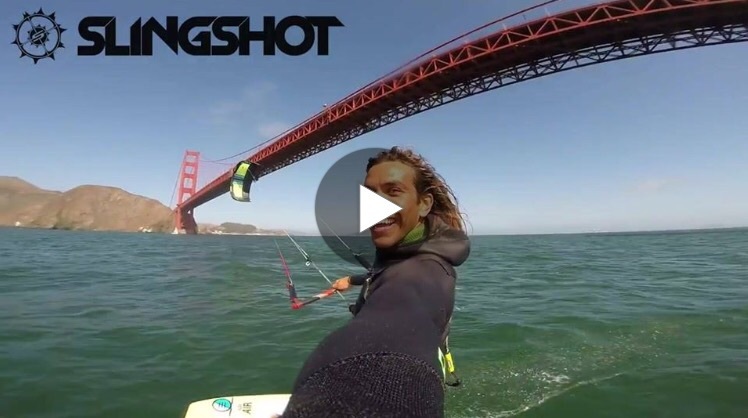 Slingshot boys Eric Reinstra, Mauricio Abeu, Sam Light, Alex Fox, and Patrick Rebstock score some wind, waves, and good times! There is Nothing Left To Say! It was a super fun event and i got a ton of really positive feedback. I was amazed how the crowd reacted to the strapless event, it was a really good vibe. I was honored to take first place and it think it will spur more events like this in the future with this style of riding growing with all ages of riders. It was a super fun event and i got a ton of really positive feedback. I was amazed how the crowd reacted to the strapless event, it was a really good vibe. I was honored to take first place and i think it will spur more events like this in the future with this style of riding growing with all ages of riders. The following day was the amateur main event which went off with a bang, with all the pros supporting the future groms of our sport. A Great time was had by all, thanks to the Bolstad's for putting on one of my favorite events in kiteboarding! There will be a meet and greet, poster signing, on land clinic/training session from 10-12 at Windance boardshop in hood River, Oregon. Come check out the new 2015 slingshot gear and ask Patrick about his equipment he uses all over the world. After we will head down to the beach and go ride!